We kindly ask session chairs to keep in mind the following to ensure a smooth and fruitful symposia and oral sessions. Please announce the following before the session begins. Please arrive at the session room at least 20 minutes prior to the session and visit the Operating Desk (located at the front, right-hand side of the presentation room) to inform the staff of your arrival. At that time, you will be informed of pertinent information such as changes in speakers, etc. Session chairs have the right and are responsible for ending presentations in the event that presenters exceed their allotted presentation time. Please cooperate in keeping to presentation and Q&A times for smooth operation of sessions. Find her/his coauthor and ask her/him to present. However, the presenter must be listed in the coauthors’ list. If a substitute cannot be found, please announce a recess until the next presentation time. Do not move the presentation schedule forward or start the next presentation. We kindly ask session chairs to prepare for vigorous discussions, such as by bringing up questions designed to facilitate discussions in the event that no questions are asked. *In principle, discussions in symposia and oral sessions are to be conducted in English. Symposia: Please follow the chair’s direction. Oral Sessions: 10 minutes for presentation, 5 minutes for discussion. Presentations should be delivered by your own laptop computer. Please bring your computer to the PC Preview Desk (located at the front left-hand side of the presentation room) 20 minutes prior to your presentation to check the output. Please pick up your computer after your presentation. Please bring a connector if you use a Mac computer. You can operate your computer by yourself during your presentation. output terminal such as HDMI or Mini Display, bring a D-sub 15 pin conversion adaptor. content to protect data from accidental loss. Audio output is not available. The oral presentation room is equipped with one screen and its resolution is XGA (1,024x768). Please adjust your PC resolution to XGA and check your layout. 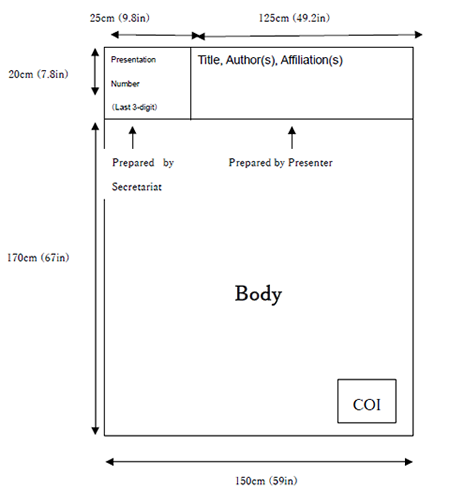 Please prepare your poster according to the following panel size and figure. Posters must be prepared in English. *To Industry-Academia Collaboration Poster Presenters: Please prepare your poster in English. Additionally, please prepare a handout summarizing your work in order to explain more clearly to participants from industry, and distribute it to interested parties during the poster session. All presenters are required to make a disclosure about the state of conflict of interest and it should be stated at the bottom of your poster. Please refer to COI (conflict of interest) Declaration for more information on COI. All the set-up and removal of the posters must be done within the time indicated above. Presenters should use pushpins to put up their posters. Pushpins will be prepared at the venue. No other adhesive method is permitted on the boards. Presenters are required to be in front of their posters wearing the ribbon you receive at the time of registration during the presentation and discussion time. Poster presentation will not be moderated by a session chair. Please answer appropriate actions following these guidelines and answer questions that the audience may have. All posters remaining after the removal time will be discarded by the Management Secretariat. The organizer will not be responsible for any theft, loss or damage to the posters. Approximately 5% of Japanese men (3 million people) and 8% of Caucasian men have a specific type of vision that makes it difficult to distinguish between colors in a particular range, including red and green. In light of this, you are requested to take the following points into account when preparing presentation materials. Images of two-color staining or DNA chips should be displayed in green and magenta, not in green and red. In graphs and explanatory figures, it is extremely difficult to match colors shown in two separate places. For this reason, do not use only color-coded descriptions or legends for different items but also write them directly into figures. Do not differentiate between items by using different colors, but rather with different types of lines, shapes/symbols, or various types of hatching. On a dark background, please use white, yellow, or orange letters rather than thin, red or blue ones as much as possible. * For further information, refer to http://www.nig.ac.jp/color/. Industry-academic collaborative neuroscience research entails benefits to society (public interest) from the fruits of disseminating academic and ethical responsibility, as well as money, status, rights, and other benefits (private interest) acquired attendant on industry-academic collaboration. When these two types of benefits are in conflict within an individual researcher, it is called a “conflict of interest." The occurrence of a conflict of interest is unavoidable in today's complex social activities, and legal restrictions apply to certain activities. The first author who submits an abstract must register her/his disclosure information for potential conflicts of interest within one year before abstract submission. This registration process follows “Guidelines on a Conflict of Interest (COI)” set by Japan Neuroscience Society (disclosure requirement applies only to the first author). Please refer to the JNS page on the Online Abstract Submission system for details, and mark the boxes which match your status. Please place the information either at the top or on the last page of your slides, or the bottom of your poster. You have no conflict of interest to disclose. You have conflicts of interest to disclose. For more detail regarding COI, please refer to the JNS website.